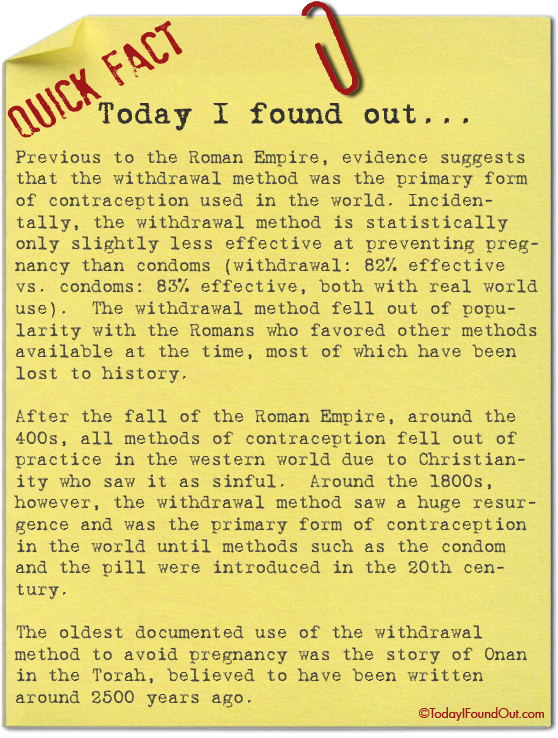 Previous to the Roman Empire, evidence suggests that the withdrawal method was the primary form of contraception used in the world. Incidentally, the withdrawal method is statistically only slightly less effective at preventing pregnancy than condoms (withdrawal: 82% effective vs. condoms: 83% effective, both with real world use). The withdrawal method fell out of popularity with the Romans who favored other methods available at the time, most of which have been lost to history. After the fall of the Roman Empire, around the 400s, all methods of contraception fell out of practice in the western world due to Christianity who saw it as sinful. Around the 1800s, however, the withdrawal method saw a huge resurgence and was the primary form of contraception in the world until methods such as the condom and the pill were introduced in the 20th century. The oldest documented use of the withdrawal method to avoid pregnancy was the story of Onan in the Torah, believed to have been written around 2500 years ago. I just wanted to note that condoms are only that effective overall and as the SOLE contraceptive method. If properly fitted and used with spermicidal lubricant and/or other contraceptive aids, condom use becomes more than 97% effective. @Bogo: That’s true, but if properly done, the withdrawal method is also significantly more effective than the “real world” usage numbers.